At least an hour before serving the salad, prepare vinaigrette by whisking all ingredients well. Refrigerate til ready to use. Wash, dry and tear spinach leaves into bite size pieces. Put figs, onion into a large bowl. Dress the salad with vinaigrette. Put salad into individual plates. Garnish with shaved parmesan. This is really good, especially if the parmesan is shaved in biggish pieces. Serve Salad with Rustic French Bread or crusty baguette. And a careful man puts in the salt. Of course, an Italian would use wine vinegar rather than waste balsamic vinegar. I use this simple recipe with great success, adding lemon juice in place of some or all of the vinegar, ground pepper, a little thyme, tarragon, ground brown mustard seeds and/or garlic, depending on my whim. At least an hour before serving the salad, prepare raspberry vinaigrette by whisking all ingredients well. Refrigerate til ready to use. Wash, dry and tear endive (or escarole or frisee lettuce) in bite size pieces. Fry chopped bacon til fairly dry. Slice the chevre in ¼ inch rounds. Put the slices between wax paper and sprinkle with sesame seeds on both sides. Press down gently but firmly to get the sesame seeds to adhere. Fry in a nonstick frying pan for 2 or 3 minutes or until warm. Dress the salad with raspberry vinaigrette. Put salad into individual plates. Sprinkle with chopped bacon. Place a piece of chevre on each plate. Serve Salad with Rustic French Bread or crusty baguette. Into a small bowl put oil, vinegar, chili pepper, honey. Whisk it together for a minute or two. Set aside. Wash oranges well and zest one. Put the zest into the bowl. Peel oranges, making sure to get rid of the pith. Slice thinly in rounds. Place in the serving dish. Peel red onion and slice thinly in rounds. Add to the oranges. Trim fennel bulb. Julienne and add to the oranges and onions. Pour the dressing overtop and toss. Add salt and pepper. Cover the serving dish with plastic and refrigerate until serving time. 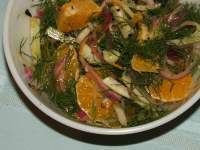 At serving time, toss the salad once more, adding the mint and fennel fronds. Serve as a side with grilled meat or fish. Into a large bowl put oil, lemon juice, mustard, salt and pepper. Whisk it together for a minute or two. Put in whole, peeled clove of garlic. Set aside. Boil unpeeled red potatoes til tender. Drain. Cut into 1 inch cubes. Put hot potatoes into the large bowl with the oil and lemon juice mix. Gently stir around making sure all the potatoes get covered with oil mixture. Add blanched green beans into large bowl with potatoes. Turn them over to cover with marinade. Let potatoes and beans marinate in fridge til cold. This can be done a day in advance of serving salad. 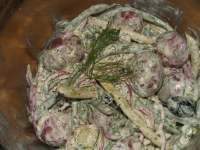 In a small bowl, mix together mayonnaise, yoghurt, chives, parsley and dill. Set aside. Remove garlic clove from large bowl and discard. Add green onions, red onion, radishes, black olives and cucumber into the large bowl with potatoes and beans. Add mayonnaise mixture in and gently mix together. Use your hands. Add salt and pepper to taste. N.B. All quantities are approximate and should be adjusted for individual tastes. Grill chicken breasts (or use left over roasted chicken) and let cool. Dice. Toast whole almonds and let cool. Mix chicken, almonds, celery, green grapes, onion, Dijon mustard, mayonnaise, salt and pepper in a bowl and refrigerate. Serve the salad on a bed of lettuce and red pepper. Garnish with whole green onions and fresh herbs.